For many years I taught courses in imaginative writing to college students, and when it came time to read their work, I kept three tools of the trade close at hand. As might be expected, a few students ignored that warning or took it as a dare, teasing or testing the Monster with intentional clichés. But most understood that this silly little figure had a serious role to play in their education. Broadly speaking, the Cliché Monster engendered awareness of the tendency, common to us all, to write, think, and even feel in clichés. More subtly, his presence made novice writers aware of the difference between a common English idiom, which might add a conversational flavor to a sentence, and an outright verbal cliché, which is to language and thought what dead cells are to the skin. To say, for example, that you’re at your wit’s end is to enlist an admissible, if rather tired, idiom. But to say that you’re “at the end of [your] tether” is to emit the scent of cliché and invite a visit from the Monster. And to write (or say) that someone should “step up to the plate,” or worse, that one or another political party is “kicking the can down the road,” is to offer the Cliché Monster a meal of prime red meat, a verbal feast of clichéd perception. As has often been noted, the practices of writing and Zen have much in common, and nowhere is their common ground more evident than in this issue of freshness. Many years ago, in a public interview, an unsuccessful candidate for the presidency of Alfred University observed that “we have to have a cushion in case there’s a ripple in the admissions picture.” I took note of that remark, not only because it was a masterpiece of mixed metaphor but also because it entirely befogged the candidate’s meaning. What he meant to say, I eventually discerned, was that the university needed to have funds in reserve in the event that enrollment dropped. But his conceptual language, being a tissue of clichéd metaphors, stood between the listener and the import of the speaker’s words. As proponents of clarity and vivacity in the use of language, teachers of composition disdain clichés chiefly because they dull the student’s work and tend to obscure its meaning. From the vantage point of Zen teachings, however, clichés are to be avoided because they exemplify, in extreme form, the propensity of conceptual language to mask the reality it purports to illuminate. Readers of this column may remember that its title refers to the Japanese motto ichigo ichie, which is closely associated with the tea ceremony and is usually translated as “one time, one meeting.” As this motto asserts, each meeting of host and guests in the tea hut is unprecedented and unrepeatable. However governed by custom and tradition, each is a once-in-a-lifetime experience. And what is true of the tea ceremony, Zen teachings tell us, is also true of our experience generally. By relying upon clichéd language, we deny the “suchness” of each new experience. To call a landscape “breathtaking” is not only to be less than fresh in one’s thought and expression. It is also to overlook the particulars of that particular landscape—or ignore its uniqueness altogether. Having placed the mountain or glacier or fjord in the category of Breathtaking Landscapes, we may cease to see it afresh. Nowadays most printing is done by computer, and the printer’s cliché is no longer in service. But clichés themselves are alive and well, as a glance at a newspaper or an hour spent watching Meet the Press will readily verify. And though I have long since retired the Cliché Monster, I have thought it advisable to keep his mental counterpart in close proximity, especially when writing prose or verse. Like Hemingway’s famous “BS detector,” that little dinosaur has a job to do. * Zoketsu Norman Fischer, “Impermanence is Buddha Nature,” Shambhala Sun (May 2012), 50. I am indebted to Stephen Dunn for introducing me to his Cliché Monster, who became the model for my own. As I recall, however, Stephen’s monster was not a dinosaur, much less a Tyrannosaurus Rex, and he was probably no match for mine. Like many blog writers, I am not a writer. But like some blog writer-wanta-bes, I want to think my writing has gotten better. But I wonder if you could bring your TRex to criticize and improve some of us. I have never thought of the cliché issue — I fear to read past posts and find them litter with reptile food. I wonder if you have ever considered helping bloggers to get better. How would you do it? Could they invite you to criticize their posts — could they pay you back by putting your TRex pic on their blog right-hand column with a link saying: Blog Guru! Sabio – Thanks for your suggestion. The field of blogging is quite varied and includes gifted and seasoned writers as well as novices. I suspect that many people write blogs for extra-literary reasons: to share their experiences, explore their interests, understand themselves, and so on. If could make one suggestion to beginners, however, it would be to write a draft of a post, put it aside for a few days, and return to it with fresh eyes. Then cut the draft to seventy-five per cent of its present length. Like imposing a syllable-count in verse, that stratagem almost always enhances the quality of the finished work. Great suggestion. I almost always let a post sit, I always cut it back, and I always read it outloud. But they are still very lacking. Clichés will be good to keep an eye out for, but I am rather allergic to trite, empty phrases and try to avoid them by nature. Curious: Do you feel “mindfulness”, “dualistic” and such can be used as clichés by Buddhists? Or is there another linguistic word for those sorts of words — for of like “faith” for Christians. “Mindfulness” (sati) is a technical term in Buddhism. It is one of the Seven Factors of Enlightenment and one component of the Noble Eightfold Path. To view it as a cliche would be rather like viewing the Trinity or salvation as Christian cliches. Over the past twenty years or so, the word mindfulness has entered the mainstream, and in the process it has lost much of its force and original precision. Sometimes, for example, it is used as a synonym for attention, a usage that omits the ethical component. Or it is employed as a synonym for awareness, which is not quite accurate. “Dualistic” is a descriptive term, but it’s also a kind of shorthand. It’s often more economical to refer to “dualistic thinking” rather than explain that such thinking discriminates between this and that, self and other, good and bad, etc. Perhaps in the context of Buddhist commentary the word is overused, but it has yet to enter popular culture. So its expiration date may be longer. When certain words are used mainly by specialists in a field, they are often referred to as the “jargon” of that profession. That is a faintly pejorative term, however. By contrast, “argot” is neutral and “lingo” informal. Yeah, “mindfulness” and “zen” have become marketing terms among Buddhophilic tree-huggers. I think you are right — it has lost its force and no longer has precision. Interesting about “expiration date” on Dualistic. Have you read Glenn Wallis’ blog (Speculative Non-Buddhism) or David Chapman’s Blog (Meaningness)? They address the hackneyed and manipulative misuses of these words. As you said, “Jargon” is a good word but perhaps “hackneyed, meaningless, manipulative euphemisms” is often the case. To me they are meant to immediately get headnods instead of turn on the brain. It is in-house signaling. I rarely see it used otherwise. “Argot” is a new word for me. Thank you. 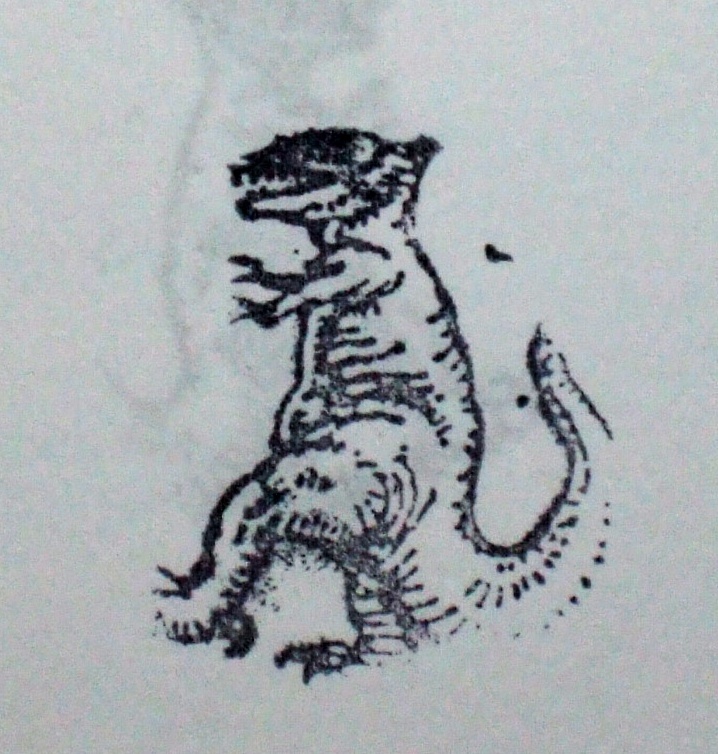 I love this dinosaur — I’d stamp him all over most American Buddhists writings.